The chain of late Roman fortified settlements built in the Kharga Oasis, in Egypt’s Western Desert, represents an interesting case-study to analyse how the ancient Roman town planners interacted with the landscape. A peculiar feature of the site is the existence of a prevailing, north-westerly wind, and it is possible to identify the average azimuth of the wind by measuring the central axes of the half-moon shaped sand dunes which characterize the landscape. 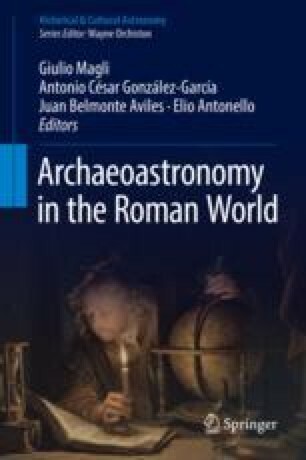 Using the methods of archaeoastronomy, we compared these azimuths with the orthogonal layout of both the settlements and the agricultural installations and showed that these are oriented on the prevailing wind. A description and the possible implications of this ‘weathervane orientation’ are discussed in this paper.